The Waterfall Card was the in thing to do a few years back. I made a few and everyone that received one loved them. They are a neat little thing to do and pretty simple. I did a .cut file for the card to make it more simple for me to make them. 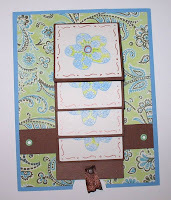 My friend LacyGilbertson had posted a video for a Waterfall Card. 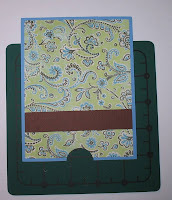 I just loved the card but I sure hate to have to do a lot of measuring. When I was watching the video I thought "DANG! I could make that with DS and then all I have to do is cut! Well so I went to designing. And then thought I should go ahead and post directions on my blog in case someone needed them. So when I got ready to cut I took pictures. Hopefully my instructions will be easy to understand. I did do two versions..one is the WATERFALL CARD - GEORGE and the other is WATERFALL CARD - PLANTIN SCHOOLBOOK since I know some people don't have George. The instructions are the same for both versions. You can click on the pictures to make them bigger if you want to see closer details. 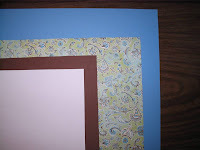 I used some sky blue card stock for the base, some My Mind's Eye paper for the mat, some brown card stock for the strips and stamped images mat. 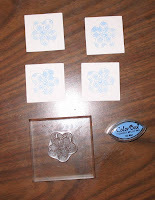 And white for the stamped images. These are the cuts you will end up with. The mats are labeled for easy identification. 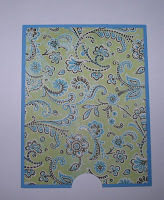 I don't have a 1 inch circle punch so I just made the circle cutout with DS....saves time don't ya think!! Also I have included scoring lines on the long strip. They are two tiny score lines for each fold. Just score on those and you have to do NO measuring *YEEHHAAWWW*. Just score on those lines and then fold. 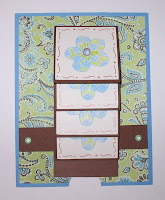 Next line up your mat on top of your card base. 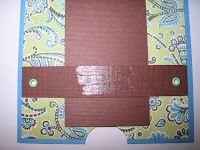 The circle cut outs at the bottom will line up, this also helps with getting your mat and base straight. And no need to go out and buy a 1 inch circle punch. The base measures 4 1/4 x 5 1/2 inches. The mat measures 4 x 5 1/4 inches. I lined up 3/4 x 4 inch strip about 1 inch from the bottom of the mat. I did use a tiny bit of adhesive on the ends to keep it in place while I punched holes for the eyelets so it would stay straight. Here is a picture after the eyelets are attached. 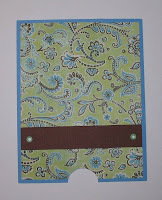 I used a lime green eyelet since I thought it matched the mat paper well. 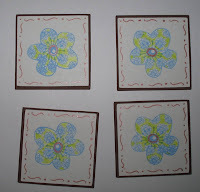 Next I stamped my images on the 1 7/8 inch white squares. I used an autumn leaves stamp I had since I thought it went with the paper well. I used a sky blue Color Box Cat Eye Ink pad. Next I slid my long strip under the thin strip. I then ran 3 lines of ATG tape onto the thin strip. Then making sure my thick strip was where I wanted it I folded down the part of the strip that has the score lines on it. Which is easier to see what I am talking about in the next picture. Once had my thick strip down good I put a line of ATG tape at the top of each square. You can see the score lines pretty good in this picture. I then attached each square STARTING AT THE BOTTOM at the score line (or a hair below). Here you can see where the square is taped in reference to the score line. This is how the card looks with all the little images attached. For the pull I just used some ribbon and a mini brad to attached it to the bottom of the long strip. You can either write or stamp a sentiment to the long piece of the card that pulls out. Which I forgot to do, but since I don't know what I will use this card for I think I will wait and do it later. 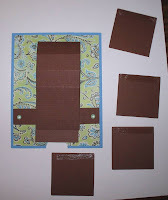 Okay I am trying to show a video of how the card works when it is done. I hope it turns out okay. I just used the video feature on my digital camera so the quality might not be too good, but I wanted you to see the card in action. OMG THE VIDEO WORKED!! I know the quality isn't good but at least you can see how the card works. It was kinda hard to do having to hold the camera and move the tab! You can see how the long piece comes out.......that is where you can write your greeting!! That is a neat card!! Another great idea from you. I look forward to checking in each day! You are so clever! Leave it to Okie to figure out a great cut file! Thanks for sharing! Great video. Thanks for sharing! You are very talented and I love your humor.